This year’s anniversary was all about personalization. I gave my boyfriend this vodka bottle, but also made him some special cookies. After 5 years, chocolate chip just won’t do. 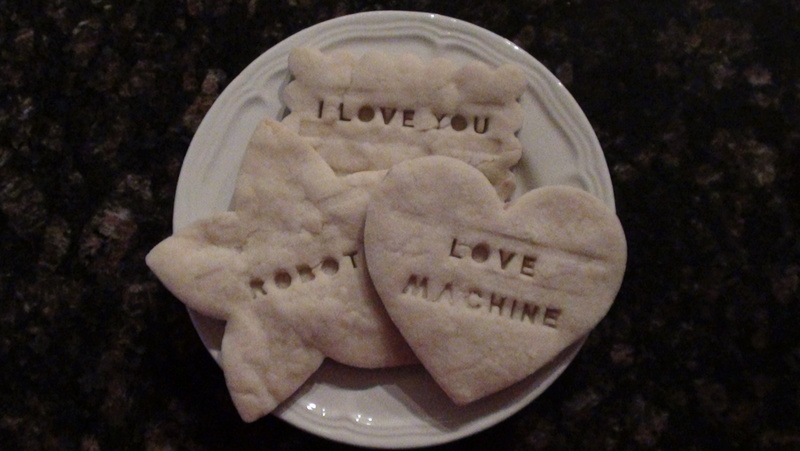 These cookies, with love and robot themed phrases, were made especially for him based on some of our inside jokes. The cookies were made with an extremely simple kit from Williams-Sonoma. I went in to check out the Star Wars Pancake Molds, and yet seemed to walk out with these. Man, that store’s dangerous. The kit comes with three cookie cutters and plenty of letters to put in and spell your own phrases. Everything is extremely simple to use and clean. I look forward to whipping these cutters out for a variety of parties and occasions. What phrase do you think would be best to put on/in a cookie?